So you had installed NewRelic in your servers successfully, now what? 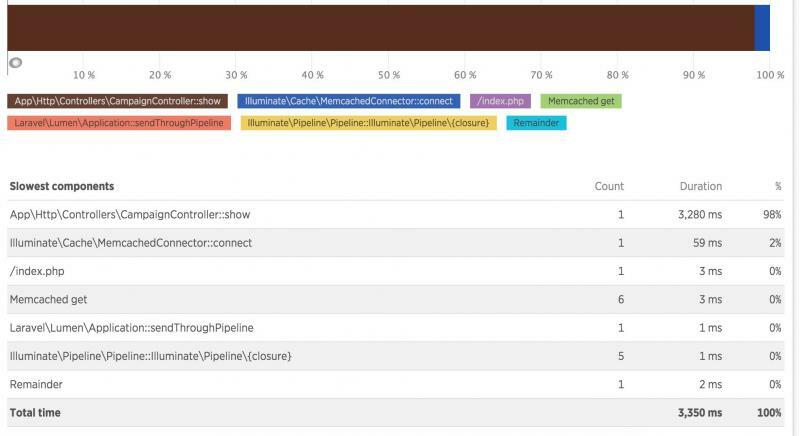 New Relic spoils us with its beautiful charts and intuitive user-interface but behind the scene is a complicated concept of data model that allows these awesome feature to be even possible. For example, looking at the chart above taken from a PHP+MySQL Web application, one could easily infer that spikes in the graph signify something is "wrong" and it also tells us that a huge percentage of the application's response time is being spend in pulling some data from MySQL. But go on deeper and you'll be encountering a lot of keywords that you don't know what is the meaning in NewRelic's context. Events Database? what the hell is that, and how it is related to this thing called metrics? CPM, RPM, Apdex... what the hell any of this has to do with my web application? If you have the same questions in mind, then this article is for you. This post assumes you have some background about application monitoring and knows the significance of it. Event- a record of "something" that had happened. For example when a web page is viewed or a backend script is executed, or a PHP script is executed. Along with these event are Attributes that further describe the event itself, for example the browser that was used when the web page is viewed, the country where it is viewed, and what particular date and time the event it had happened. You can then slice and dice the events further based on these Attributes. You can easily think of Attributes as Fields in the tables present in the Events database. The tables themselves can be of wide variety and is commonly called as Event Type, for example Transaction and PageView are the most common event you'll be dealing with. Metric Timeslice- is like a "snapshot" of certain value of interest during the particular period of time. For example, it is like asking "how much we had earned now" (metric timeslice) vs asking "give me a list of sales we have right now" (events). In this example, you are not really interested in all the details, but only asks for a simple value, a number associated with time (the time when you asked the question) vs actually asking the entire list of sales that was made including all the details. Picture it like this in your mind: My Company is using New Relic products, which in turn collects data from my web servers, those data can be either an Event or a Metrics Timeslice. The above basically allows you to select all fields from the PageView table - sounds familiar right? It is like an old-school SQL-syntax you already know, except for the fact that all the data collecting parts (INSERT/UPDATE is already being automatically inserted for you) and the only thing you need to worry about is querying and analysing the collected data itself. whereas SINCE specifies the start and UNTIL specifies the end range of the time filter. Moreover, you can read the official documentation for the complete list of NRQL keywords/functions. These are things you might want to have a better understanding of, as they are the business processes that directly effects whatever will gonna be outputted in the user's browser sooner or later. That is what New Relic's APM (short for Application Performance Monitoring) is for. You can inspect the fields related to this event in Data Explorer, execute a few queries to see what is there. And more often than not, you'll be able to get the hang of it like how you did in PageView event. Within each Transaction, are Segments which are the actual calls to the database etc. Note that the Transaction.Name values might confuse you, as the values can be taken based on "backend" script that is executing that. For example, if your app is using as Laravel Framework, the transaction name might end up as WebTransaction/Action/Home/index whereas the Home is the Controller and the Index is the method of that controller. More often, that is the ONLY thing you are interested into, as it signify some unexpected issue happening within your infrastructure. Unfortunately, this can be only inspected via the APM UI (at the time of writing, Feb 2017) and one can not query this via NRQL. Some of you might say, all these data collected by NewRelic is great, but what if I want to associate some custom data?. That is where the Custom attributes is for, since we know that attributes is just a fancy name for field in those events database, one can easily infer that adding additional field to a Transaction of PageView is simply adding custom attributes during the application execution. This can be done via frontend or backend code. See the official documentation to know how to do this.